Beginning this week, you’ll be able to go beyond simply playing your videos within Google Docs -- you can now insert your videos into Google Sites, embed them anywhere on the web, and caption them for your viewers. 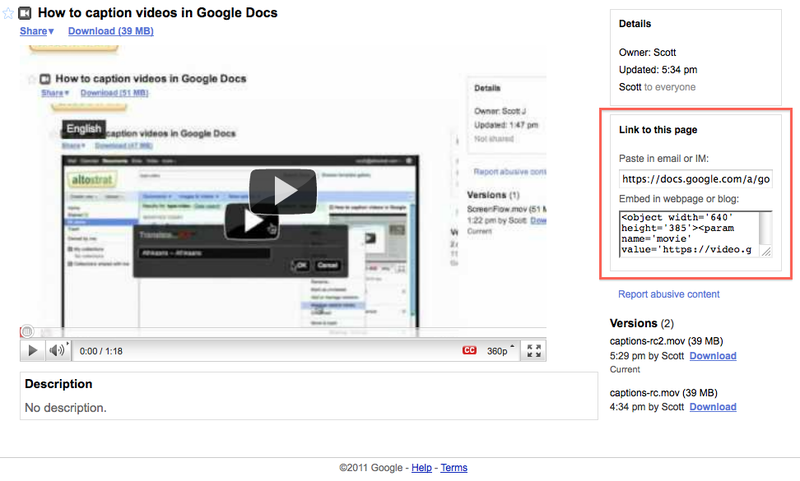 While on your Google site, go to the Insert menu and select Video > Google Docs Video. From there, choose from the videos that are in your documents list and click Select to insert the video into your Google site. You can embed your videos anywhere else on the web by using the HTML snippet that is now available on the video’s page. Keep in mind that whether you’re embedding your video into your Google site or somewhere else on the web, only people to whom you’ve given access will be able to view the video. For example, if the video is set to private and shared with four people, only those four people will be able to view it on your Google site. To give it a try, choose Manage caption tracks from the Actions menu for your video, then click Upload caption track... Anyone who has edit access can upload a track. Let us know what you think of these new features by leaving us a comment -- or better yet, a video.